Whether it’s minimizing manufacturing costs, finding the shortest path around a city, or finding an optimal airfoil design, optimization problems are everywhere. An optimization problem, simply put, is the problem of finding the best solution from all feasible solutions. But how would you determine the best solution? That is the million dollar question. Suppose you were tasked with creating a box to hold liquid. The requirements state that the area must be at least 16m2 and every meter of material used in the perimeter costs $2.00. What’s the cheapest box you can build? Solution: The cheapest box with an area of 16m2 is 4 x 4m and costs $32.00. Gradeschool level math is sufficient in solving equations with simple relationships and few variables, but what about more complex problems? It turns out that life on Earth is incredibly complex. Trillions of living cells interact every day to make up the body known as you. From a strictly biological point of view, life is a game where the objective is to stay on Earth as long as possible. The cells in your body can’t keep this up forever, so the only possible way to prevent your own extinction is by duplicating the important parts of your own existence and making … a new version of you. This, of course, is called reproduction. Not every living creature makes the cut. Some are killed early – by hunting, disease, or starvation. Some just can’t find a suitable partner. If you’re an African impala and constantly being hunted by carnivourous predators, there’s no guarantee that you’ll live long enough to ensure your spot in the gene pool. But if you did have to outrun a lion, might your odds be slightly more favourable if you could run just a little bit faster, jump a little bit higher, and see a little bit farther? Over time, the less fortunate impalas would be killed off, leaving the faster impalas to reproduce and pass on their “code”. This “code” is found in every living organism in a special chemical called DNA, and among other things is responsible for tweaking the aforementioned variables. Despite looking nonsensical, scientists have discovered that certain functional groups of code at certain locations are responsible for the biological traits found in the organism. These groups are called genes. 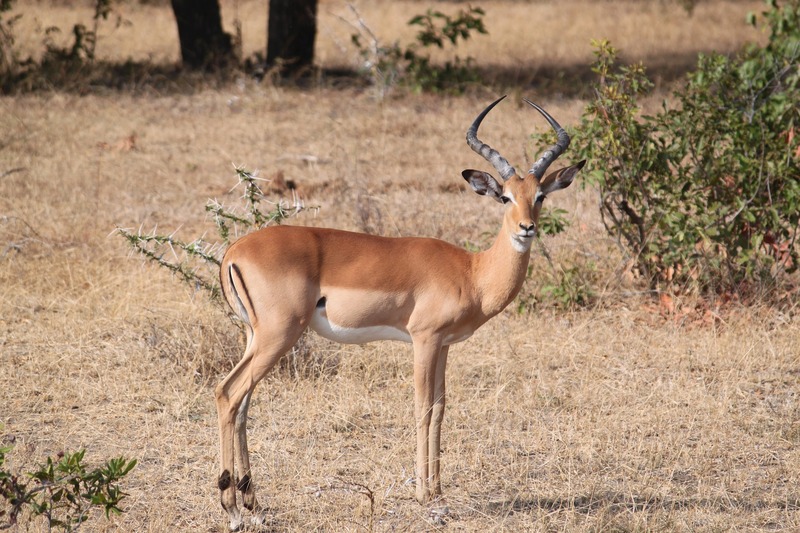 The perfect impala would have both beneficial traits (running faster and jumping higher) and would be more likely to out-compete the impala who drew both short sticks, running slower and jumping lower. I hope the concept of natural selection is becoming evident: despite the randomness of genetics, better traits are more likely to stay in the gene pool and worse traits are more likely to be killed off. Here’s where it gets interesting: we can simulate the process of natural selection in a computer model to optimize any solution. A monkey hitting keys at random on a typewriter keyboard for an infinite amount of time will almost surely type the complete works of William Shakespeare. How difficult would it be to type a given text completely randomly? Is that even possible? Yikes! That’s a one in over 300 million chance to get a simple five letter word! And “Hello World”? Even typing eleven new letters every second since the beginning of the universe wouldn’t guarantee success. Let’s try a different approach; one inspired by genetics. In this post, we'll look at the code that creates this example. If you're not interested in that, flip the toggle below to hide it. We’ll start by creating a population of 500 random strings with a length of 29 characters each (the length of our desired quotation). These strings represent a single chromosome in each individual. letters = "ABCDEFGHIJKLMNOPQRSTUVWXYZ " # Letter A-Z, plus space. Those words don’t look anything like the quotation we’re trying to recreate. But exactly how dissimilar are they? We need a quantifiable metric that can tell us exactly how close our chromosome (that is, the string) is to the the quotation. This is called a fitness function. Fitness functions can come in many forms, but the general idea is that they’re given an input (that is, our string) and they output a number between 0 and 1 depending on how close our input is to the goal (with 1 being most optimal/perfect). In this example, a fitness score can be determined by calculating how many characters are both the correct letter and in the correct location. The purpose of our genetic algorithm is to get the fitness score of a chromosome to 1.00. That is, all letters will be correct and in correct position. Now that we have a list of each member of the population and their respective fitness, we want to decide which ones should be selected to create the next generation. One method to do this is called fitness proportionate or Roulette Wheel Selection. Imagine all the chromosomes are placed on a roulette wheel, with the size of their pie being their fitness (that is, less fit chromosomes will have smaller slices). The higher the fitness (yellow), the more likely the marble will select the chromosome. The lower the fitness (red), the less likely. Starting at the top of the list, cumulatively add the fitnesses until the sum is greater than our random number. The chromosome in this position is our selection. Repeat steps 3-5 for as many parents as we want. Step 3-4. Select a chromosome from the roulette wheel. Let’s go ahead and select two parents using our roulette wheel selection. For convenience, I’ve highlighted the correct areas in the same fashion as the fitness step. Crossover: Two parents chromosomes are split and recombined (either down the middle, at a random point, or at multiple points) to create a new chromosome. Mutation: A (typically random) change is made to the chromosome. This can be randomly adjusting (adding or subtracting) a value, swapping or changing the order of values, or randomly changing values. Typically a combination of crossover and mutation is used with a ratio dependent on the problem being solved (for example, crossover with 10% chance of mutation). We can create populations and evaluate their members on fitness. We can select the best ones and use them to create new chromosomes from crossover and/or mutation. We have all the pieces we need to implement this algorithm. The last step is to repeat these continuously until we achieve our goal. Below are the results of running the genetic algorithm using our implementation. It took less than a second to successfully converge on our goal, and did so after only 88 generations! Remember the brute-force method we discussed earlier? Even using every computer in the world to generate random strings for the remainder of the universe would likely not yield the results that we achieved. They’re inspired by the ingenuity of nature: the same process that created all of life. They’re (relatively) easy to implement in little code. They can easily be applied to a wide variety of problems. They’re significantly more efficient than a brute-force approach. There are many more aspects to genetic algorithms that haven’t been covered. Future posts will introduce things such as elitism, encoding, and different selection methods. Available in the near future. Check back soon! Studying software engineering, I have an interest in machine learning, data science, and the application of technology to improve life.